A FAST-growing East Yorkshire construction company has moved into the last available office on one of the region’s most sought after business parks. 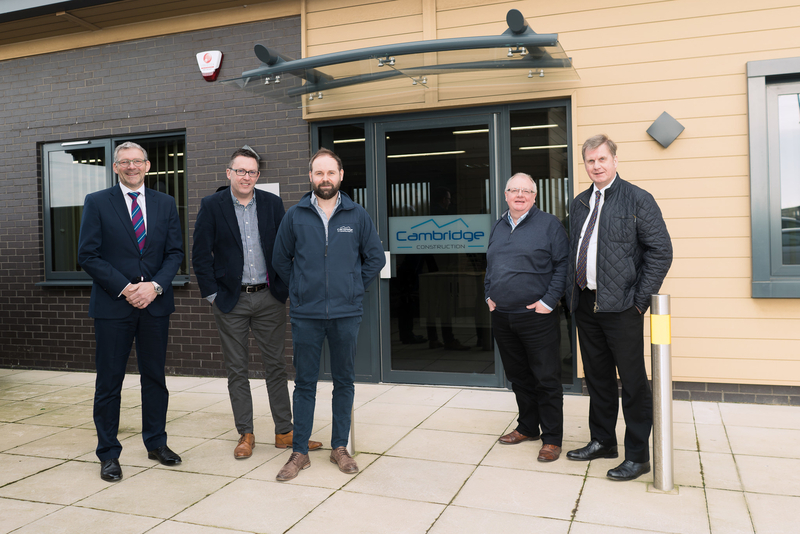 Cambridge Construction, which specialises in civil engineering and commercial and industrial construction, has taken a 900sqft office unit at Green Park Business Park at Newport. The three-year deal means all existing office units of the first phase at Green Park are now occupied, but with more of the site to develop, further offices will become available in the future. Cambridge Construction join a host of other top-named businesses on the park, including leading public relations agency The PR Company, road surfacing specialist Scientific Roads, J.D. Garage Equipment and park owner and developer, the Horncastle Group PLC. Louis Bradley, construction director at Cambridge Construction, said there were a number of drivers for the move, but chief among them was the proximity to their parent company, horticultural engineering experts Cambridge HOK. Cambridge HOK is based on Wallingfen Park, Main Road, Newport, just a stone’s throw from Green Park Business Park. Mr Bradley said: “Cambridge Construction started life as a civils company carrying out site preparation and infrastructure work for Cambridge HOK, but since then we have branched out and started working directly for third parties. “Despite being a fairly young company, we’re already involved in some prestigious projects and we have ambitious plans to double our turnover this year. Mr Bradley added that other factors had also made the deal attractive. “Horncastle were very good to deal with,” he said. Ian Hodges, managing director of the Horncastle Group PLC, described leasing the final office in the first phase of Green Park as a ‘milestone’ in the business park’s history. However, he added more offices would be available in the future. He said: “As a young and ambitious company, Cambridge Construction is a fantastic fit for Green Park Business Park so we’re delighted that they have taken the last available office. I hope they will be very happy here and realise their ambitious plans for growth. Green Park Business Park is an environmentally friendly, 20-acre, mixed-use business park consisting of prime office, industrial and warehousing space, destined to become a hub for businesses over the next few years. It was created to give forward-thinking businesses access to high-quality accommodation but with low running costs, and includes a 78m, 500KW wind turbine supplied by Emergya Wind Technologies (EWT) UK Ltd. The first phase was part-funded by the European Regional Development Fund 2007 – 2013. For more information go to www.greenparknewport.co.uk. Photograph (L-R) Ian Hodges, managing director, the Horncastle Group PLC; Steve Hinch, finance director, Cambridge Construction; Louis Bradley, construction director, Cambridge Construction; Ross Hibbs, commercial director, Cambridge Construction, and; John Holland, technical director, Cambridge Construction.